The past few weeks have been busy, mostly on the home front where we've entered into a tidying frenzy, targeting the rooms upstairs. We braved Ikea and bought shelving, then dived into trying to sort out the mess that our two spare rooms have become. After two weekends of dedicated effort, I think we're slowly making progress although there's a lot more to do yet. I'm now pondering what to do with about 250 to 300 books which are going out, not through choice but simply because I have nowhere to put them. Not to worry though, I still have lots of books left... Although it remains to be seen if they also get earmarked for the door on a later cull. On a more positive, although expensive note, I bit the bullet and changed my car, making the exchange last weekend. I was thoroughly happy with my Ford Focus Estate, so I bought a direct replacement. Namely, I traded in my eight year old Focus for a three year old Focus. Now, I did try to replace the car last autumn, approaching the local main Ford dealer looking for a suitable 3 year old vehicle, but was told they didn't have a single Focus Estate on the lot; they couldn't get one in and there was no call for them... They could of course order me a brand, spanking new one if I wanted? After I politely refused, the sales person then remarked that mine was the fourth enquiry after a 3 year old Focus Estate they'd had that weekend. Prompting my thought that if they stocked the cars, they might actually sell them. Anyhow, I've spent the past few weeks lurking on Autotrader, looking for the right car. I'd used Parkers to get an idea of value, both for my own car and any prospective new purchase and about two weeks ago, I spotted a likely candidate. I contacted the dealer, arranged a test drive and with minimum fuss had agreed to buy a car. I collected the new car on Saturday and so far, while I'm still getting used to it, I like it. Last but not least, it was Dave's birthday earlier this week, so we arranged a day out on Sunday to celebrate. 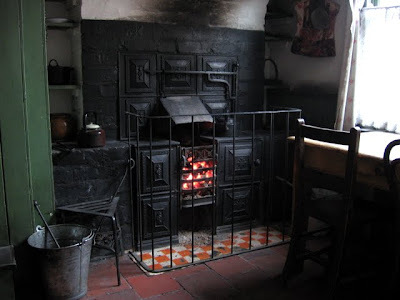 Our chosen location was the Black Country Living Museum and Richard has already written up the day on his blog. The day was a cold one and using a camera meant taking my gloves off, which I was reluctant to do as I like my fingers where they are! However I did take a few pictures that I'd like to share. The first one is the 'Tilted Cottage'. 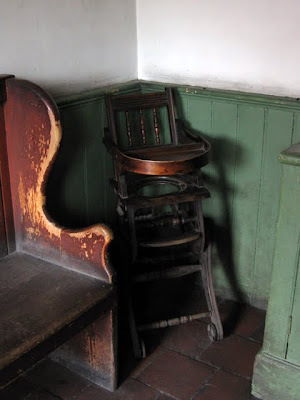 The Museum is doing it's best to reproduce what life was like during the 19th century by creating a village from genuine period buildings which have been relocated from sites around the area. 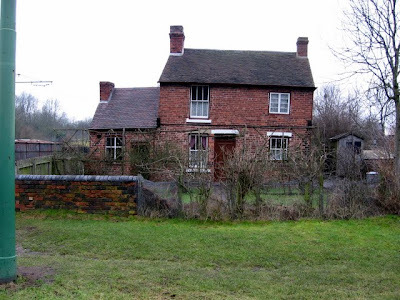 The Tilted Cottage is one of many such buildings, but unlike most of the others it was subject to a lot of subsidence (Which is not uncommon in the area due to mining). Over the years, rather than collapse, the cottage twisted and tilted until not a single wall or floor is straight. According to the lady inside, when the cottage was rebuilt it took several attempts to rebuild it just as twisted as it originally was, but at the same time pass the modern building/safety regulations so it would be safe for people to enter. They'd done a good job but I've got to say that I couldn't stand in it for very long. Just inside the front door was as far as I could go as the wierd angles on everything and the feeling of everything leaning in on itself was so nauseating that it made me feel sick. Dave loved it though and stayed inside long after Richard and I had retreated to the outside where we admired the steel collar around its outside that was keeping the whole thing upright. And a baby's high chair. Now this one isn't that different to the ones you'll find in the shops today. Although I'm not sure about the hole for the potty. It was convertible, going from a high chair with a tray, to tray flipped over the back, to a low chair to a rocking chair. A very versatile piece of family equipment. 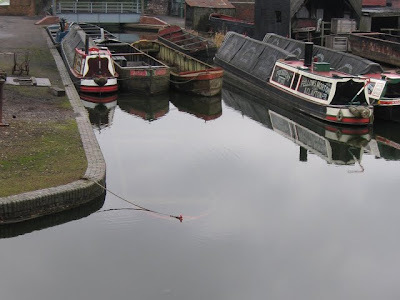 And finally, because I thought it was atmospheric - I took some pictures of some barges on the museum's canal. 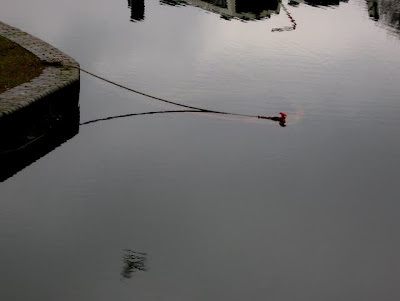 I was particularly drawn to a sunken barge which hopefully you can see through the water.